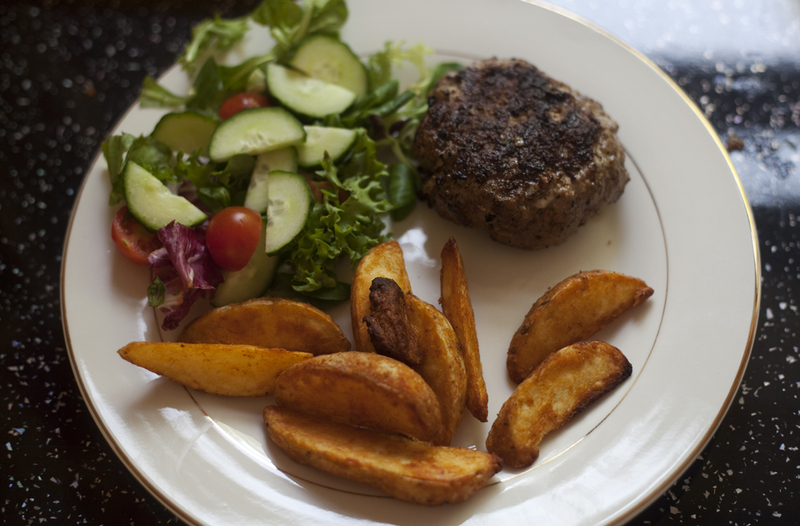 This recipe is seriously tasty and a lot better than shop bought burgers. These are really customisable and you can really add/take away ingredients to your own tastes. I made these really quickly before our tea, not in advance but they do freeze really well if you’re using fresh mince. With the toppings/combinations the world is literally your oyster! Here I had them with wedges (alas not homemade – short on time!) but any combo of bun/fries/chips/wedges will be fantastic. I always have my burger bun-less but take your pick of bun options too! You could really make these healthy by using turkey mince, or spicy by adding your favourite flavours. 1 – Break up the mince in a bowl. 2 – Add the egg and breadcrumbs. 4 – Season well and mix together throughly. If you’re using other spices etc add them at this stage. 5 – Shape the buns on a tray. Make a small well in the centre of each burger and pop in some cheese. Any will do – mozzarella is perfect! Cover the cheese with the burger mix. 6 – Place on to a griddle pan or frying pan and cook for about 10-12 mins. That’s it! Very simple but really tasty. I think it’s the freshness of the ingredients and flavour combinations. This is the first time I’ve made these in a while and they still taste great! Let us know which flavour combinations you decide to go for! Enjoy! What a tasty looking dinner. It really was! They’re worth trying out!